Usually when a professional sports league decides to expand and add a new team, early results are not great for the franchise. An expansion draft takes place, where the newly-added team gets to pick from a handful of players that the rest of league did not want to keep. This means low talent, which translates to low success. This has been true for virtually every single expansion team in any league in North America, with even average performances being triumphs. However, that changed when the Vegas Golden Knights went to the NHL Stanley Cup in what would be the greatest inaugural season in sports history. In March of 2017, the Vegas Golden Knights completed their expansion and began operations as an official NHL team. The Golden Knights began to fill their roster in the expansion draft, taking notable players in former Pittsburgh Penguins goalie Marc-Andre Fleury and Nashville Predators James Neal. Vegas was also given the first pick in the 2017 NHL Draft, taking Cody Glass as their first official draft pick ever. Hopes were high for the Vegas Golden Knights, but no one could have seen what was coming as the 2017 – 2018 season began. Despite it being their first game ever as a team, the Golden Knights came away with a win behind expansion draftee James Neal’s first two goals in franchise history. While that was great feat, the Vegas Golden Knights historic season would not stop there. The Golden Knights wound up 8-1 to start the season off, giving them the best start in NHL history for an expansion team through their first nine games. Accomplishments like this would continue to be set all season, and in December set the expansion team record for fastest to winning six straight games. As their first regular season as a team came to a close, the Las Vegas Golden Knights found themselves with the best regular season record of any expansion team in the league’s history. Their 51-win season made them the top team in the Western Conference’s Pacific Division, and made them the first expansion team to make the playoffs since both the Edmonton Oilers and the former Hartford Whalers did it in 1980. Also, by leading it since Christmas and clinching the Pacific Division title at the end of March, the Golden Knights became the first expansion team to win their division in all of the four major North American sports. Entering the 2018 NHL playoffs, Vegas was tasked with taking on divisional foe the Los Angeles Kings. The Golden Knights got their first playoff win in franchise history with a 1-0 victory. They went on to sweep the Kings in the series, reaching yet again another feat no one thought was possible, becoming the first team in league history to sweep any playoff series in their first season as a team. The historic season would not stop there, and the team faced off with the San Jose Sharks in the second round of the playoffs. 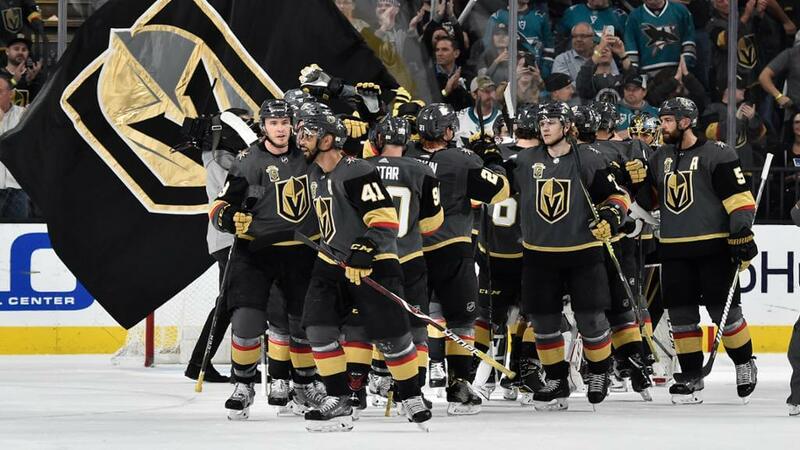 Defeating the Sharks four games to two, the Golden Knights became just the third team to ever win multiple playoff series in their inaugural season. This success continued into the Western Conference Finals, when the Golden Knights beat the Winnipeg Jets in five games to become only the third team in their inaugural season to make it to the Stanley Cup Finals. The Vegas Golden Knights headed in the finals looking to be the first expansion team to win the Stanley Cup in their first season as a team since the Toronto Arenas did it in 1918, just the second year of the NHL’s existence. Facing the Washington Capitals, the Golden Knights took a 1-0 lead and only needed three more wins to win the whole thing. However, the Capitals would lead a furious comeback, taking the next four games to defeat Vegas for the Stanley Cup Finals 4-1. Despite the Stanley Cup loss, the Vegas Golden Knights inaugural season can be chalked up as a massive success. Along with the numerous accomplishments already mentioned, the Golden Knights also had several players and personnel be named to their own accomplishments. Both Marc-Andre Fleury and James Neal were selected to represent the Golden Knights as players in the 63rd NHL All-Star Game, while Vegas head coach Gerald Gallant was picked to coach the Pacific Division of All-Stars. The Vegas Golden Knights inaugural season was nothing less than spectacular. While it was unknown how their first season in the NHL would play out, no one could have expected a Western Conference title and a Stanley Cup appearance. As the Golden Knights begin their second season, their expectations will be great as they build off their success their inaugural season success and accomplishments. The Vegas Golden Knights inaugural season was nothing less than spectacular. While it was unknown how their first season in the NHL would play out, no one could have expected a Western Conference title and a Stanley Cup appearance.